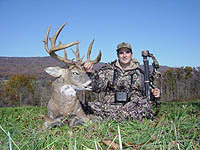 Since my 1999 hunt where I killed my largest whitetail to date (249 5/8), on October 31, hunting whitetail around Halloween has always been special to me. 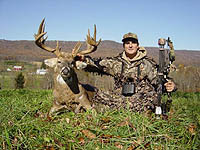 I have also taken huge bucks on the dates of October 18 and October 28. So, I have learned this can be an important time of the year to be in the woods. 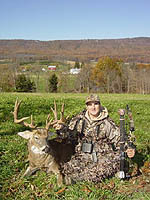 For this years late October hunt I had planned to be in Pennsylvania with my friend and hunting partner, Richie Bland. We were hunting the South central part of the state in very hilly terrain. When we arrived, it was raining heavily, but by the following morning the weather had improved and conditions were good. Not being familiar with the property our guides escorted us to the tree stands they had located for us prior to our arrival. It was cool and still, with a layer of fog hugging the ground as my cameraman, Jason Huntsman, and I climbed into position. As the morning light began to build I could see our stand was located at a bend in an old logging road. In front of us was a large cutover area grown thick with a variety of young trees, bushes and shrubs ranging between 4 and 12 feet. Below our stand was a flowing stream lined with larger hardwoods behind us was more cutover followed by mature timber. It wasn’t long before we spotted several deer, does and fawns, at a distance and moving uphill through the cutover they were feeding as they went, undoubtedly heading for some morning bedding location, but in no real hurry to get there. We had a slight breeze from the East blowing down hill. It made me wonder what would happen if a deer chose to work up the longing road. It wasn’t long until I found out a young buck appeared out of the fog about 80 yards downhill. He approached steadily until he was about 40 yards. His nose came up as he tested the breeze. I held my breath waiting for his reaction after a minute or so he continued up the road then, once again, caught a whiff of scent. With his suspicions confirmed he turned around and retraced his steps, crossing the creek about 70 yards below us. Soon after he was out of sight a much larger buck was seen moving up the logging road. As he cleared the trees obscuring my view I could see he was a shooter. 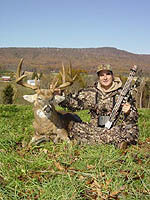 With dark, massive antlers there was no question I would try for him, so I lifted my bow off its holder. At almost the same spot as the smaller buck, the big deer became suspicious and also lifted his nose into the air. With very little hesitation he turned around and circled well below our stand site that was enough for me. It was obvious this was a good location: too good to stay in with this wind direction. Jason and I climbed down and spent the best of the morning scouting for new stand locations. We found several potential sites before going back to camp. That afternoon we moved down the hill and set up in a tree stand only 100 yards from a Greenfield that had been seeing good activity. Over the coarse of the afternoon hunt we spotted four different bucks moving toward the Greenfield, the best of which was an incredible not typical with multiple brow points erupting from his bases. Above that was a magnificent 5 X 6 mainframe with a variety of extras. This buck, even larger than the one seen in the morning, came close but offered no shot as he made his way to his chosen feeding location as darkness fell we made our way back to the vehicle with great anticipation for the mornings hunt. On the second day of the hunt our strategy was basically the same, except we were faced with significant rain that caused us to hunt from an enclosed blind uphill from where we had had the action the previous morning. This blind overlooked a small food plot that had been planted to corn during the summer. As the morning progressed the rain continued but that did not stop the deer from filtering through. What we saw were mostly does and young bucks that stopped to feed briefly on their way to the bedding area. After about two hours the rain let up and we decided to go look around for likely treestand locations for the afternoon hunt. As we began our scouting mission we traversed across the hillside on which many of the deer were bedding. We jumped a few does and fawns, but that could not be helped. It was interesting to see this new habitat, and entertaining to look at the trail system, trying to determine the best locations for a new stand. This, to me, is one of the most exciting aspects of deer hunting. To use your brain to locate a stand in exactly the right location to intercept a big buck is both challenging during the process and deeply satisfying after you have been successful! We saw many promising locations near scrapes, and a couple of locations that caught our eye near one of the largest rubs I have ever seen a whitetail make! This rub looked more like it was made by an elk! Undoubtedly, this was a community rub, and looked like a great place to encounter a pre rut buck looking for one of the season’s first hot doe. We settled on this location to erect a stand for our afternoon hunt. After breakfast we were back at this location to get our two treestands up as quietly as possible. I was using the treestands and climbing sticks made by Lone Wolf. I use two sets of their climbing sticks which gets me up about twenty-five feet up in the tree. We cut out the interfering branches and then made shooting lanes from ground level. Then we vacated the area for a couple of hours before it was time to return for the afternoon hunt. 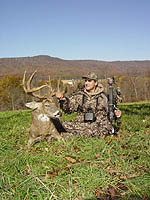 As is typical of early season whitetail hunting in the afternoon, we had very little action until it was close to dark. The last 45 minutes, however, was action packed with sightings of several does and three nice bucks. The best buck that moved through the area was an impressive 6 x 6 that came walking down one of the logging roads about 35 yards out. He was on a fast walk and passed through the shooting lanes so quickly there was no time for a shot. This buck was old, at least five. I would have taken him if I could but the shot opportunity newer presented itself. To complicate matters further, Jason Huntsman, who was filming from the stand on my left, never had a clear view of the deer so video would have been almost impossible. We watched as this beautiful 160 plus buck passed by and then continued on in search of a hot doe. As the evenings light faded and all hope of having a giant buck cruise by our stand was lost, thoughts turned to the lodge where and excellent meal of venison backstrap was waiting for us, along with an opportunity to share a few stories with long time hunting buddies. We headed back to the camp with great anticipation for tomorrow’s hunt. After a favorable wind shift, Jason and I decided to give the treestand from the first morning’s hunt another try. Conditions were almost identical, except we felt the wind was now blowing in our faces enough to keep the scent from reaching any deer that chose the logging road as his trail up towards the bedding area. We were in the stand and settled well before good shooting light, waiting, watching, and enjoying the awakening of the morning. This has always been my favorite time of the day. There is so much anticipation and so many possibilities one never knows what to expect. As our light increased we could see does and fawns out in front of us moving through the cutover area. They were feeding and slowly advancing up the hill towards where they would eventually bed, much the same as they had done the first morning. I spotted movement through the trees downhill from our location. A deer was moving up the logging road towards us but I could not tell whist it was. As he finally cleared the obstructions I could see he was a nice 2 year old ten point. Now as he got closer we would be able to test the wind direction to see if deer approaching up the logging road would spook. He continued up the road until he was only 35 or 40 yards away. With a slight swirling of the wind the buck became alert. He had caught a whiff of us, even though we had taken every precaution; bathing with scent elimination soaps, and full Scent blocker suits. I’m not saying these precautions don’t help, but don’t let anyone tell you can completely eliminate a deer’s ability to smell you. Any animal that can smell on particle per million will detect even the slightest human odor. Just as the buck reversed course I spotted a second buck coming up the road. It was the big nontypical from the morning before! I was certain we were going to have a repeat performance ending in both deer skirting our position. But, as the big buck began closing the distance on the younger buck, the younger deer moved off the logging trail. the big buck continued up the trail in a relaxed mood. As he got closer I felt the light breeze swing more in our favor. I had, by now, indicated to Jason that I would indeed take the shot and had my bow in hand with release attached to the string. There was on opportunity to stand as the deer’s angle during his approach presented to great a risk that he might spot me. I pivoted in the seat as much as possible to get the best possible position from which to shoot. the giant, black antlered buck kept moving in, forty, then thirty yards. Screened by branches there was no shot opportunity as he now stood testing the breeze. I was confident he would continue up the trail as the wind still favored us. For some unexplainable reason he exited the logging road and began making his way up a side trail leading into the thick cutover. This was not expected! I quickly found the only opening he might pass through and came to full draw. My only choice was to wait with my pin centered on this opening hoping he would step into it. If he did, I would release the arrow as I saw his shoulder pass in front of my pin. I concentrated on the opening trying to envision his progress as he moved in the direction of the small opening. The first thing I saw was his rack as he approached the hole with his head down. My heart jumped as I saw he would pass right through the small hole that would allow me to take the shot. Within a split second his shoulder was in front of my pin And I touched of the release. I remember the flight of the arrow as it streaked to the target. As it contacted the deer he lurched forward and ran up the hill. I knew the shot was good and tried to follow the buck. He stopped about forty yards form where he had been hit and, almost immediately became wobbly. Within seconds he was down … within sight of us! Jason who had been as busy with the video camera as I had been with the bow, and who always gets as excited during one of these encounters as I do, was perfect in every aspect of the segment. Later review would show that he had captured not only the deer’s approach and the impact of the arrow, but had pulled wide at the moment I drew the bow and had then gone back tight on the buck in time to capture a perfect “over the shoulder” kill on tape! 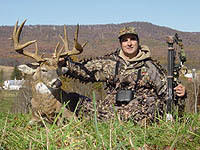 We “high fived” and relived the moment in quiet whispers as we each expressed everything we had been feeling from our different perspectives, each with our own set of worries about what could go wrong as the big buck approached. My first inclination was to climb down immediately to go see the buck. Then I realized the morning was young and it was now Jason’s turn to hunt. It would be foolish to waste the best part of the day recovering a deer we knew was down, so we stayed in the tree for another hour and a half. Although we saw some other deer nothing older than two years old passed within eyesight of our stand. Finally I could take it no more, and we vacated the tree to go and view my buck. This buck was all anyone could ask for, a dark antlered non typical with great balance on each antler. His typical points were well matched on both sides, as were his nontypical points, making for what I consider the most attractive of racks. I don’t know what this buck had been rubbing on but his rack was stained about as dark as any rack I have seen. We again relived the final moments of the hunt before heading off for the truck, and to pick up Richie and Bryan Hawkins.